How Will They Know If I'm Dead? 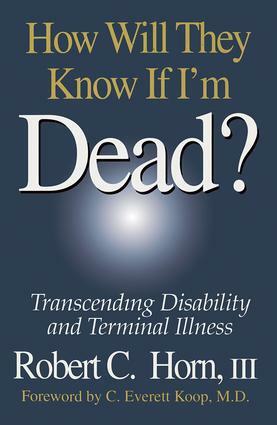 Most books on terminal illness focus on death and dying. This book is about neither. It doesn't deal with statistics or the medical aspects of a crippling disease, and it isn't written by a celebrity about their amazing recovery. This book is about a real person and a true hero. Bob Horn, an authority on the Soviet Union and foreign policy in the Third World, a successful author and teacher, an involved husband and father of three in his mid-forties, awoke one day to find his entire world upside down. Diagnosed in 1988 with ALS (amyotrophic lateral sclerosis), better known as Lou Gerhig's disease, Bob had to deal with the reality that his situation was terminal. How Bob and his family coped and continue to cope or "battle" as Bob prefers to call it with disability and terminal illness is an amazing story that you will find inspiring, heartwarming, humorous, upsetting, and a celebration of the triumph of life. Having already beaten the odds that say he should have died years ago, Bob accomplished the most unbelievable feat he wrote this book. It was discovered that Bob had a pulse in his right foot that could be felt and manipulated. By hooking his foot up to a computer, Bob found he could maneuver the cursor and produce documents. He has written articles for the Los Angeles Times, sermons for his church, correspondence, and most impressive of all this book. Not bad for a man who is completely paralyzed and hasn't moved in six years!